For many of us, the kitchen is the beating heart of the home, where the family comes together to cook, chat, and enjoy delicious meals. Often, this can mean that our beautiful kitchens end up being a bit of a mess – where teacup towers teeter dangerously and lentils rain down when overfilled cupboards are opened. It doesn't have to be that way! With just a little organisation and a few pro tips, even the most well-used kitchens can be transformed into an oasis of calm where everything has its place. If your kitchen is the culmination of years of busy family life and you don't even know where to start organising the chaos, there's no need to worry. Just a few easy kitchen storage hacks can help make everyday tasks, from finding ingredients to putting away the pans, that little bit easier and neater. We've asked some of our favourite foodie bloggers for their best tips on how they keep their busy kitchens tidy. From investing in the right containers for storing dry ingredients, to making the most of a small space, their storage tips will help you transform your kitchen. You may be able to store more than you realize. Getting organised is the first step to making the most of your kitchen's space and reducing food waste. Whether it's that one tin of soup that went out of date two years ago and has been languishing in the back of the cupboard ever since, or you regularly find lettuce that has turned to mush behind all those condiments in your fridge, it can be easy to waste food through disorganisation. Charlotte Oates, of Charlotte's Lovely Kitchen, thinks that organisation is key to reducing food waste: "For me the best way of reducing waste is all about being organised with how my food is stored. I always try to keep everything in the same place in my cupboards, fridge and freezer. This way I can easily check whether I have an ingredient in before heading out to the shops. Also, when I put my shopping away I try to move the older items to the front so I remember to use those up first." 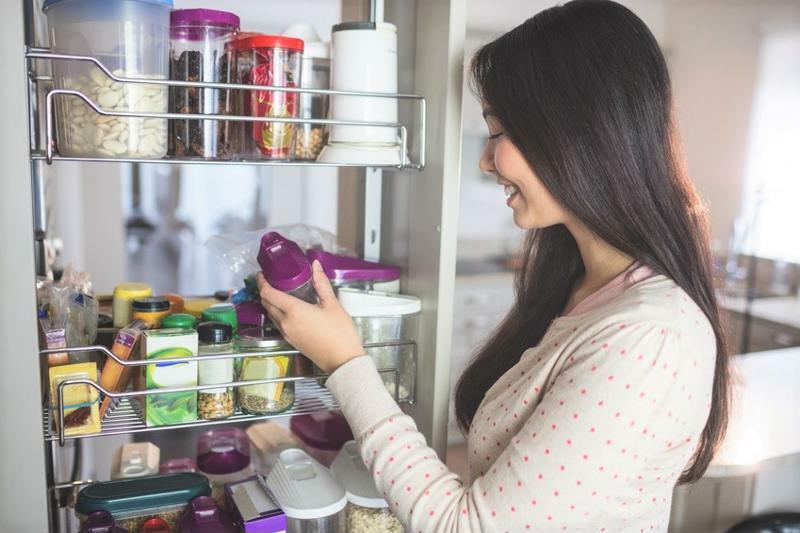 You can even take it a step further and do a proper stock take, as Jo of Slummy Single Mummy suggests: "My top tip for making the most of kitchen storage space is to regularly sort through your food and equipment cupboards. Food cupboards can get really crammed, so doing a regular stock take is very useful. Realising you have ten tins of tomatoes at the back of the cupboard already stops you buying unnecessary groceries and it's a good way to use up foods that would otherwise remain hidden." There's no need to let food go to waste as a result of poor organisation; simply put everything in its designated place and pull older ingredients to the front of the shelf. Simple! In an ideal world, we'd all have gloriously large kitchens complete with central islands and specially designed cupboards. However, the reality for many of us is that the kitchen is one of the smallest rooms in the house. So, how do we go about getting neat and organised when there's not enough room to even pick up a cat, never mind give him a swing? Well, there are plenty of ideas out there on how you can get the most out of your space, no matter how small it is. Transform a small space with the right tips. Hedi of Hedi Hearts suggests displaying attractive utensils and ingredients: "If you have fancy looking pots and pans, mount a simple rack from your ceiling and hang them on it. Install a wire wall grid and magnetic strips to keep kitchen tools handy and add couple of small shelves for your pots with fresh herb plants." 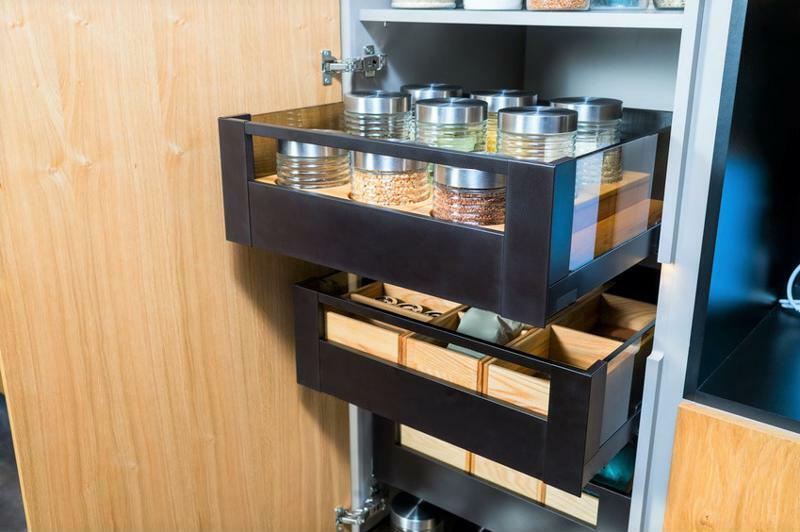 Buying or making attractive storage to display your ingredients, rather than trying to hide it away in a too-small drawer is another popular solution. Jenny Ripatti-Tayor of Let's Talk Mommy found that it was the perfect way to the make the most of her small kitchen: "I used to have a tiny kitchen, so kitchen storage space was essential and I had to get as creative as possible. I lined the backs of my countertops with large mason jars and used chalkboard stickers and brown twine around the lids to make them look like kitchen decorations as much as storage solutions for all my pastas, beans, coffee, tea bags, and baking ingredients." If you're lucky enough to have someone in the house who's handy with screwdriver, you can even set about customising your shelf space like Elizabeth of Elizabeth's Kitchen Diary. She says about her clever kitchen adaptations: "Here at Elizabeth's Kitchen Diary, we work in a rather small kitchen space with limited storage so we've put our DIY skills to work in creating custom built wooden shelves and a spice rack to fit the available wall space – so all our spices are visible and within reach while cooking." Alternatively, you can follow Becky at Munchies and Munchkins' example and change the way you look at your kitchen. 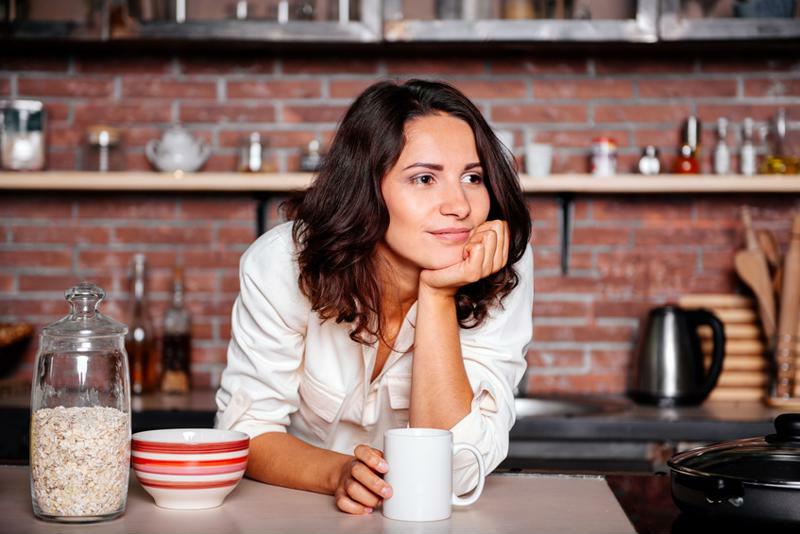 She says, "I have a really small kitchen and there seems to be a constant battle between my love of gadgets and condiments, and my need for a large clear space to create and photograph my recipes. "It is amazing how well space can be utilised if you give it some thought. Placing shelves in dead space, such as above fridges and boilers is a handy way to store items you don't use that often. My favourite space saver is actually something really simple. I have an herb and spice rack on the inside of a cupboard door. It holds 30 bottles and saves so much storage space and also I can see all of them at a glance which avoids them lingering in the back of my cupboards for years on end." How effectively are you using space in your cupboards? When it comes to organising hacks for your kitchen, it can make a lot of difference to change the way you use your drawers. Kate Hackworthy of Veggie Desserts found that thinking outside the box and using her drawers for more than just spoon storage made all the difference. She recommends that you do the same: "My favourite kitchen storage hack is to use a drawer for spices. I have a LOT of dried herbs and spices, so keeping them in the cupboard meant lots of rifling through them to find what I wanted, and always knocking over a few jars. "Since the jars are small, there was also a lot of wasted cupboard space above them. Now that I keep mine in a drawer, I can instantly see what I have (by labelling the lid) and they never fall over. I keep sweet spices on one side and savoury herbs on the other, so I can locate the ones I want in seconds." Genius! If you've got a freezer that is anything larger than an icebox, it's pretty likely that it is the kind of storage space where 5kg bulk buy bags of petit pois and leftover lasagne go to die. To upgrade your freezer space to well a well organised bit of storage is pretty easy with handy tips from Claire Jessiman at Foodie Quine. She says of her chest freezer: "Just tossing everything in simply doesn't work in such a deep space and will only have you scrambling for something, anything that will make do for dinner! To make the most of such valuable storage you need to get organised and it's really simple to do with the aid of some sturdy bags for life. "Firstly, separate and sort your frozen items by food groups, e.g. red meat, poultry, fish, bread, desserts, vegetables – plus any others specifically relevant to you. Put each type of item into a different bag – ideally colour coded (red for meat, green for veg...) or clearly labelled. This will make it so much easier to find what you are looking for and avoid items lurking at the bottom for eternity. "Also make sure to clearly label and date items to avoid UFOs (Unidentified Frozen Objects!). Playing 'Freezer Roulette' and having to defrost something to try and guess what it is will be a thing of the past!" It couldn't be simpler! Even just little changes can make a huge difference when it comes to the way you store things in your kitchen. Almost all of the foodie bloggers and experts we chatted to mentioned how important organising your containers is. From picking those with the right shapes to what order you put them in the cupboard, there are tons of hacks to get those containers arranged with military-like precision. Bintu Hardy of Recipes from a Pantry says that organising your containers is all down to getting the shape right: "One of my favourite kitchen storage hacks comes from my schooldays, when I was taught about tessellation in geometry. Basically, you can fit square or rectangular objects together much better than round ones. So, out with my old round storage jars, in with square ones. Now I have more room for more jars of black-eyed beans, almonds, cashew nuts, couscous etc. And with labels on the lids, I can see what I've got without having to search through them to see what is what." Glass jars make for a popular (and pretty!) storage solution for your dry ingredients. Sus Davy of Rough Measures likes to make hers into a decorative feature as well: "I like to store all my dry goods (grains, pulses, pasta, flours etc.) in glass jars on my kitchen dresser. I find I use them more because I can see them each time I pass it. Glass jars are great for storing products that may otherwise be packaged in plastic or paper, which can get damaged." Better storage makes for a better kitchen experience. You don't need to spend a fortune on pretty glass jars to get this look, though. Jemma Andrew-Adiamah of Celery and Cupcakes has a useful hack to keep your glass jars eco-friendly too: "We use a lot of glass jars bought from the supermarket, and of course, they can be recycled but they make great storage solutions in the kitchen and around the home. I like to wash mine out and sterilise them in the dishwasher and reuse them to store things like grains, dried beans, rice, and porridge oats. You can even use them to store homemade jam and preserves." 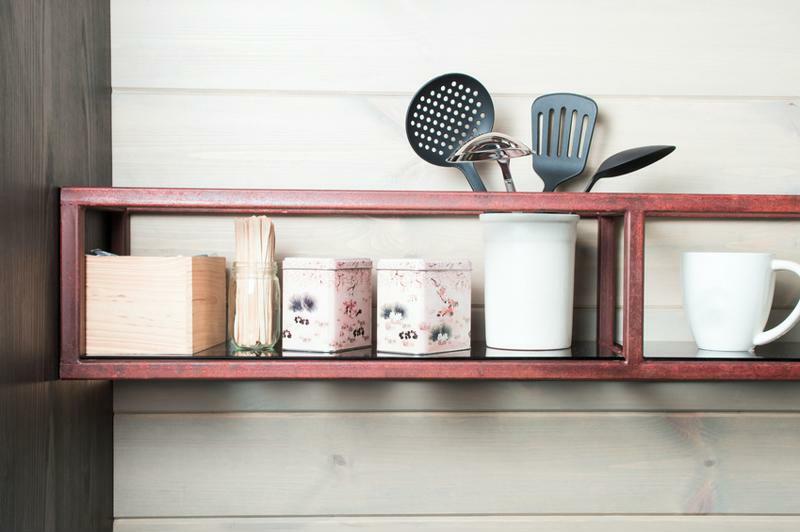 If you don't have the kind of kitchen with plenty of shelving or counter space, there are plenty of other ways you can use containers to make the most of your storage. Eb Gargano of Easy Peasy Foodie says: "I used to just shove the half used packets in a cupboard where they would all live in a jumble, until every now and again I'd have a clear out and discover I had three open packets of bulgur wheat and five half-finished packs of ground almonds (true story!). So, I went out and bought two large plastic boxes... one for nuts and seeds, the other for grains and pulses. I can store all the open packets in the two plastic boxes (which have airtight lids to keep everything fresh) and when I want to use something, it's so much easier to find – and I don't end up with lentils falling on my head, as used to happen." Problem solved! If you enjoyed this article, be sure to check out the FoodSaver blog for more tips on kitchen storage and organisation. Or, for an innovative solution to food storage and waste reduction, browse our full range of vacuum sealing systems.